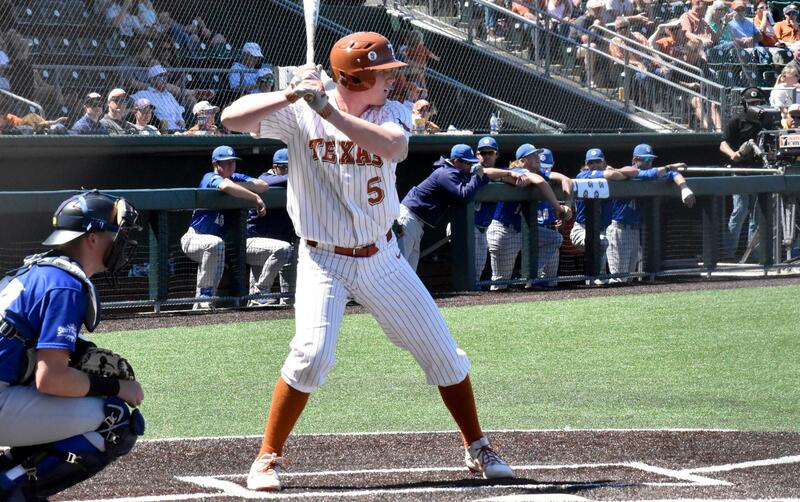 Third baseman Ryan Reynolds had two hits and drove in two runs Sunday, but the Texas baseball team fell, 12-8, at TCU to lose the three-game series against the Horned Frogs (photo courtesy of texassports.com). FORT WORTH, Texas — The No. 9 Texas baseball team racked up 13 hits in Sunday’s 12-8 loss at No. 22 TCU. The slugfest gave UT 23 runs over the three-game set with the Horned Frogs. The offensive numbers were impressive, but unfortunately for Texas and its fans, the Longhorns plated 13 of those runs in Saturday’s 13-1 win; Sunday’s loss was their second in three games in Fort Worth. Texas fell to 17-10 overall, and 3-3 against teams from the Big 12, while TCU improved to 15-7 overall, and 2-1 in Big 12 games, all played this weekend against UT. Left fielder Eric Kennedy went 4-for-5 at the plate, with two runs scored and a run driven in to lead the UT offense. Center fielder Duke Ellis, third baseman Ryan Reynolds and catcher Michael McCann also had two hits Sunday for the Longhorns. Kennedy is the team’s leading hitter, with a batting average of .320 after Sunday’s game. Texas scored the game’s first two runs when Kennedy and Ellis scored in the first inning on throwing errors, after which Reynolds drove in right fielder Austin Todd with an RBI single, giving UT a 3-0 lead after the top of the first. TCU got one run back in the bottom of the first when left fielder drilled a solo home run off UT starter Coy Cobb. Texas added two more runs in the fourth and two in the sixth to stretch their lead to 7-2. But in the bottom of the sixth, TCU shortstop Adam Oviedo hit a three-run home run to trim the Longhorns’ lead to 7-5. UT added a single run in the top of the seventh when second baseman Lance Ford scored on an RBI groundout by Todd, but the Texas bullpen could not hold back the Frogs. TCU designated hitter Hunter Wolfe led off the bottom of the seventh with his team’s fourth home run of the game to narrow the margin to 8-7. Right fielder Andrew Keefer drove in Oviedo with the tying run in the bottom of the eighth. Two batters later, Wolfe’s infield single scored third baseman Conner Shepherd with what proved to be the game-winning run, before TCU tacked on three more runs in the eighth. Texas used six pitchers in the loss; reliever Cole Quintanilla took his first loss to even his season record at 1-1. The Longhorns now travel to San Antonio to face Incarnate Word at 7 p.m. Tuesday.